Educa has a very long tradition of great choices for their jigsaw puzzles, particularly in terms of fine arts puzzles. 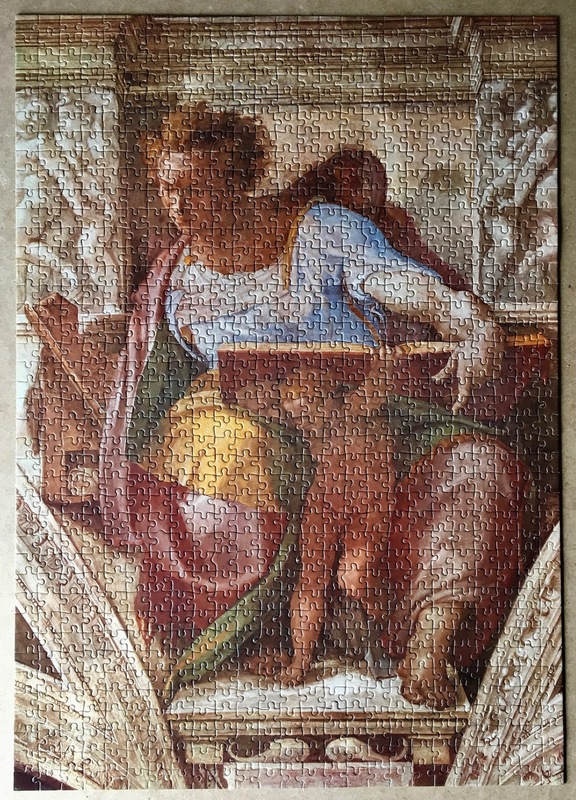 This 1000 pieces version of The Prophet Daniel, by Michelangelo, is a good example. They manufactured it in the early 80’s. The box corresponds to the design of their earlier puzzles, long before they started to publish them in the beautiful boxes with stripes, or the elegant white box design of the 90’s. This fresco painting is part of the ceiling of the Sistine Chapel. Michelangelo painted a total of 7 prophets from the Old Testament. It was common to represent the figures of the Bible with the attributes that might help people identify them. In the case of the Prophet Daniel, the most important event in the tradition was the fact that they threw him into the den of the lions as a punishment, but an angel saved him. However, in Michelangelo’s portrayal, there is no reference to the lions, which is very interesting. Instead, Michelangelo shows Daniel reading a great book, which is held up by a muscular figure from beneath it. It is interesting to note that the image of this puzzle corresponds to the painting in the Sistine Chapel before the most recent mayor restoration. Today, the image looks brighter, cleaner, and with much vibrant colors, as Michelangelo painted it. When I verified this puzzle, I counted one extra piece that I wasn’t able to detect. For that reason, I decided to assemble it myself, since I loved the image. The previous owner wrote numbers on the back of the pieces, perhaps thinking that he might put it together again. However, I made the commitment not to cheat, and I completed the puzzle without the hints of the numbers. The pieces were in excellent condition, so I had a great time assembling it. It is unfortunate that the box was not in very good condition. It took me a couple of days in December of 2017, out of desperation fighting with the 5000 Ravensburger version of The Night Watch. When you are confronted with 4000 dark pieces, you need to complete a small puzzle just to feel that you are making some progress. It was later listed for sale at Rare Puzzles. 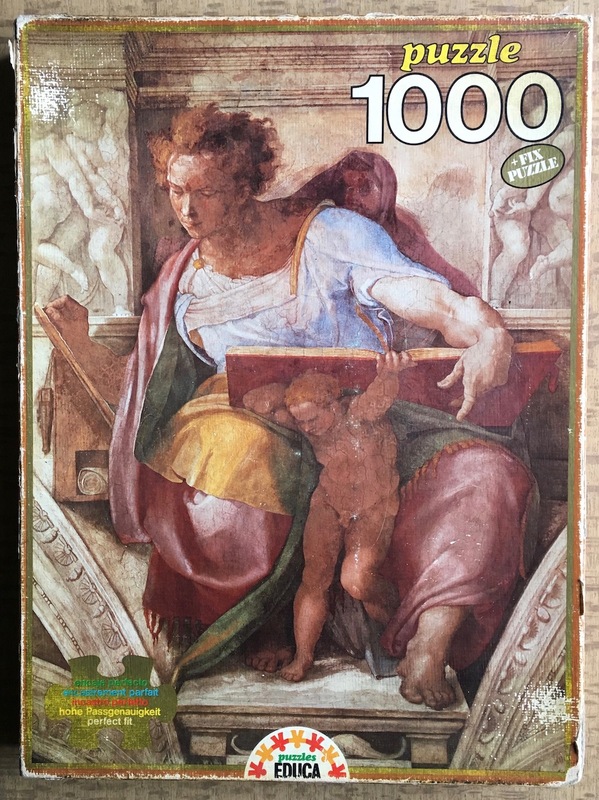 1000, Educa, The Prophet Daniel, Michelangelo, 68 x 48 cm, Reference Number 7752.